An outbreak is the sudden occurrence of a disease in a certain area in greater numbers than it normally occurs. The outbreak could be localized in a small community or in a specific location (for example, in a certain hospital), but it can also appear in a larger region. However, the outbreaks are more localized, compared to the epidemics. The outbreak can be with short or long duration. It can be a single event or can occur in a certain season, year after year. Typically all cases of an outbreak are interconnected. For example, all the infected individuals could have been infected by the same source (e.g. a contaminated water source). The outbreaks can affect from few people to tens of thousands of individuals. An example of an outbreak with limited extent is the E. coli infection in 2014, when 19 people from California, Idaho, Utah, Washington, etc. were infected from contaminated raw clover. An example of outbreak with significant scope is the outbreak of Cryptosporidium in Milwaukee in 1993, when 403,000 people were infected. An epidemic is a widespread increase in the number of cases of a certain disease in a certain area. It generally affects a bigger area and a bigger population, compared to an outbreak. The epidemic process is characterized by a continuous transmission of the causative agent of the infection among individuals. Three factors are needed to produce an epidemic – a source of the infectious process, transmission mechanisms, and disease-susceptible individuals. The epidemic can be with a different duration. It can be a single event or can occur in a certain season, year after year. An example of an epidemic is the one of the severe acute respiratory syndrome, which affected over 8,000 people from all around the world in 2003. The Polio epidemic in 1952 affected more than 42,170 people in the United States. Outbreak: An outbreak is the sudden occurrence of a disease in a certain area in greater numbers than it normally occurs. Epidemic: An epidemic is a widespread increase in the number of cases of a certain disease in a certain area. Outbreak: The outbreak could be localized in a small community or in a specific location (for example, in a certain hospital), but can also appear in a larger region. Epidemic: The epidemic affects a bigger area, compared to an outbreak, e.g. few countries, an entire continent, etc. 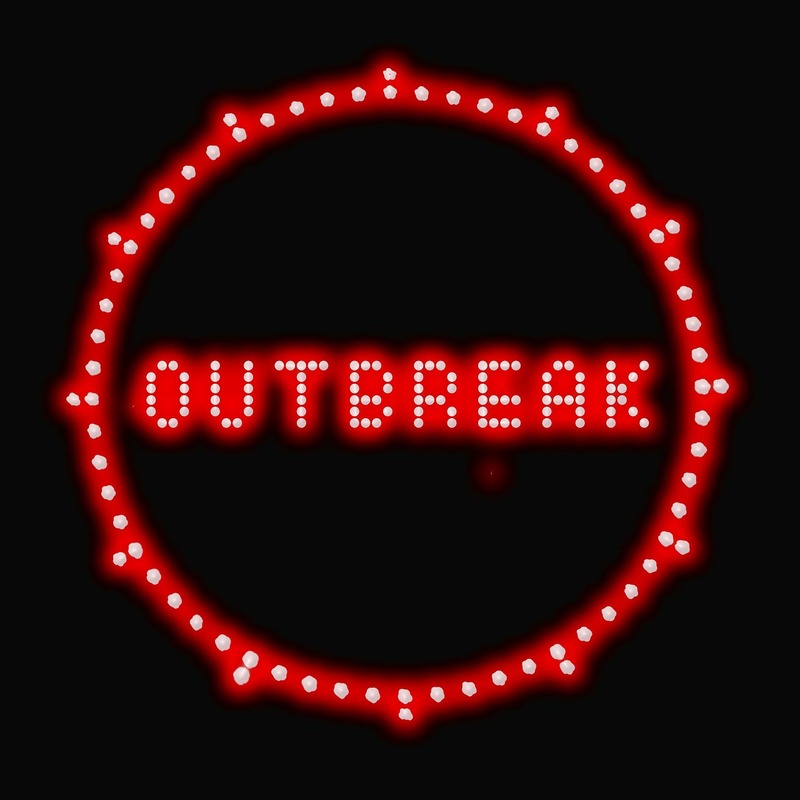 Outbreak: The outbreaks can affect from few people to tens of thousands of individuals. 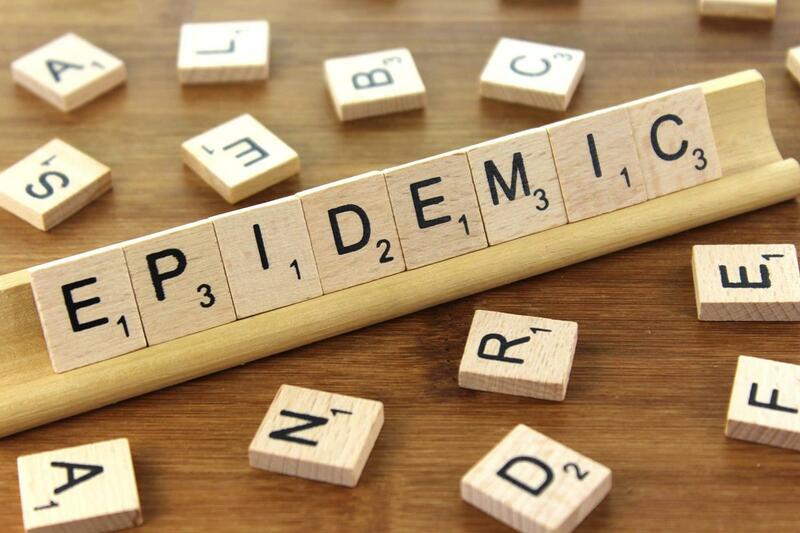 Epidemic: In general, the epidemic affects more individuals, compared to the outbreak. Outbreak: Typically all the cases of an outbreak are interconnected, e.g. all the infected individuals could have been infected by the same contaminated water source. Epidemic: The epidemic process is characterized by the continuous transmission of the causative agent of the disease among individuals. Outbreak: Outbreak of E. coli infection in 2014, 19 people from California, Idaho, Utah, Washington, etc. were infected from contaminated raw clover. Epidemic: Polio epidemic in 1952 affected more than 42,170 people in the United States. An outbreak is the sudden occurrence of a disease in a certain area in greater numbers than it normally occurs. An epidemic is a widespread increase in the number of cases of a certain disease in a certain area. The outbreak could be localized in a small community or in a specific location (for example, in a certain hospital), but can also appear in a larger region. The epidemic affects a bigger area, compared to an outbreak, e.g. an entire continent. The outbreaks can affect from few people to tens of thousands of individuals. In general, the epidemic affects more individuals, compared to the outbreak. Typically all cases of an outbreak are interconnected, e.g. all the infected individuals could have been infected by the same contaminated water source. The epidemic process is characterized by the continuous transmission of the causative agent of the infection among individuals. Example of an outbreak: E. coli infection in 2014, 19 people from California, Idaho, Utah, Washington, and other states were infected from contaminated raw clover. Example of an epidemic: Polio infection in 1952 affected more than 42,170 people in the United States. Dr. Mariam Bozhilova Forest Research Institute, BAS. 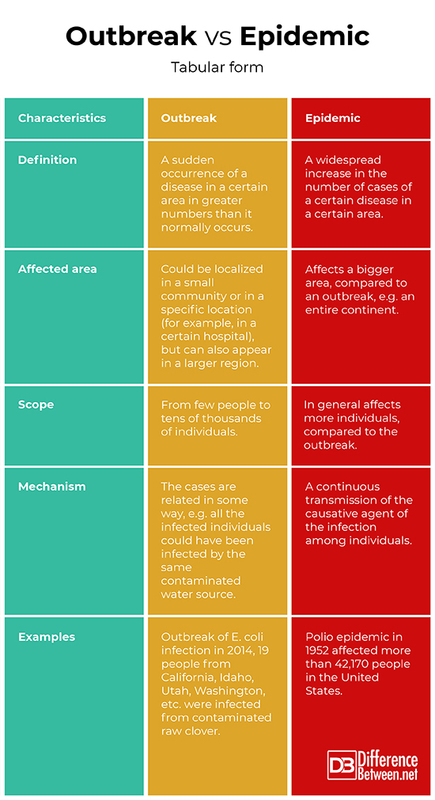 "Difference Between Outbreak and Epidemic." DifferenceBetween.net. January 9, 2019 < http://www.differencebetween.net/science/health/difference-between-outbreak-and-epidemic/ >. Bailey, L., K. Vardulaki, J. Langham, D. Chandramohan. Introduction to Epidemiology. Maidenhead: Open University Press. 2005. Print. Moon, G., M. Gould, T. Brown, C. Duncan, P. Iggulden, K. Jones, A. Litva, S. Subramanian, L. Twigg. Epidemiology: An Introduction. Open University Press. 2000. Print. Swedlund, A., G. Armelagos. Disease in Populations in Transition: Anthropological and Epidemiological Perspectives. New York: Bergin & Garvey. 1990. Print.